MINNEAPOLIS – Cargill has reported financial results for the fiscal 2018 third quarter and first nine months ended Feb 28, 2018, reporting a 22% decrease in its net income from last year’s US$715 million. According to the company, these earnings included a net charge of US$161 million related to the recently enacted U.S. Tax Cuts and Jobs Act. The adjusted operating earnings were US$559 million, which resulted to the 22% decrease from last year’s US$715 million. Nine-month earnings totalled US$2.4 billion, down 7% from US$2.58 billion a year ago. Net earnings for the quarter on a U.S. GAAP basis were US$495 million compared with US$650 million last year, while the nine-month net earnings equalled US$2.39 billion compared with last year’s US$2.49 billion. Third-quarter revenues rose 2% to US$27.85 billion, increasing the year-to-date figure to US$84.32 billion. “Our steady results from operations demonstrate that our strategic direction is the right one,” said David MacLennan, Cargill’s chairman and chief executive officer. MacLennan also cited the company’s integrated approach to global operations, its on-going appraisal and enhancement of assets along supply chains, and its investment in new capabilities and technologies. For the segment results, the Animal Nutrition & Protein posted a solid increase in adjusted operating earnings, which led company results for the fourth successive quarter. Performance in complete animal feeds, premixes, additives and micro-nutrients contributed strongly to earnings, as did beef and egg protein results in North America. The segment’s aqua nutrition and poultry businesses trailed the year-ago quarter due to a mix of factors, including lower pricing in some markets. Earnings in Food Ingredients & Applications decreased on mixed performance, with the segment the second-largest contributor to company earnings. Cocoa, chocolate and edible oils posted performance gains, with lower ethanol prices in North America and higher manufacturing costs in Europe. With interest in plant-based foods on the rise, Cargill invested US$25 million in a joint venture with Minneapolis-based Puris, the largest North American producer of pea protein. The company mills yellow peas into nutritious, highly functional proteins for use in label-friendly baked goods, cereals, dry blend beverages, snack bars and more. Through the joint venture, Cargill and Puris will expand manufacturing and commercial capabilities to support growth in new markets. Earnings in Origination & Processing edged ahead of last year’s moderate third quarter. After five years of very large crops, the build-up in global stocks has quieted markets, but volatility picked up late in the period, allowing for better trading opportunities. Origination in Brazil remained slow; oilseed processing results in several regions were poor but with an improved outlook as margins strengthened at the end of the period. 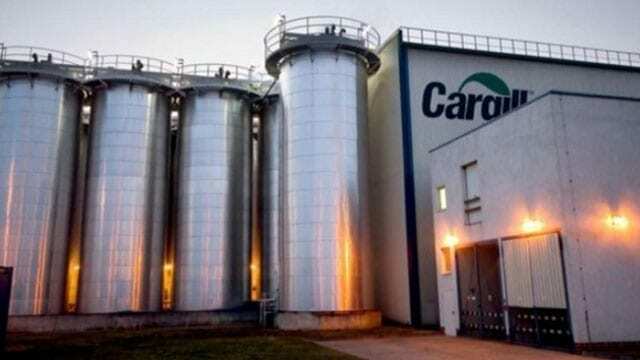 Quarterly results decreased slightly in Industrial & Financial Services, due in part to lower returns from Cargill’s fund investments against a strong comparative period. Operationally, the segment’s metals and ocean transportation businesses surpassed last year’s third quarter, buoyed by strong analytics and changing market dynamics that enhanced trading performance. Trade and structured finance moved ahead on a diversified performance. To strengthen global shipping, Cargill’s ocean transportation business announced four new partnerships with organizations committed to reducing emissions, enhancing the safety and well-being of seafarers, gender inclusion, and anti-corruption measures. Progress in all of these areas is important to the long-term sustainability of the maritime sector, which itself is a vital part of delivering food from where it is grown to where it is needed. To discover new breakthroughs for a safer and more sustainable food supply, Cargill joined with Ecolab, a leader in food safety and clean water, and Techstars, which has a proven start-up development model, to create a Farm to Fork Accelerator. The three-year program will connect the three organizations with promising food and agriculture start-ups to share mentorship, expertise and other resources. During the quarter, Cargill also launched a new partnership with Gastromotiva, a Brazil-based NGO helping to drive the Social Gastronomy Movement. This chef-led movement seeks to draw attention to the ways food can work as a force for social progress on issues such as nutrition, food waste, economic inequality and employment. The company’s three-year, US$1.5 million commitment will help bring this model to scale globally. “To fulfil our purpose of nourishing the world in a safe, responsible and sustainable way, we are looking to combine efforts with a diverse set of organizations,” MacLennan said.